Haverford alumnus and rare book preservationist Terry Belanger '63 was one of 25 MacArthur Foundation Fellows announced today. 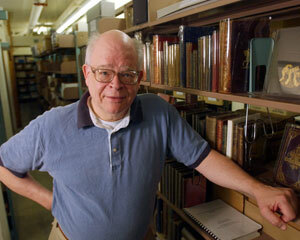 Belanger, University Professor and Honorary Curator of Special Collections at the University of Virginia, is founder of the Rare Books School, a teaching and archive facility. MacArthur Foundation Fellowships are unrestricted fellowships awarded annually to "talented individuals who have shown extraordinary originality and dedication in their creative pursuits and a marked capacity for self-direction. There are three criteria for selection of Fellows: exceptional creativity, promise for important future advances based on a track record of significant accomplishment, and potential for the fellowship to facilitate subsequent creative work." The MacArthur Fellowship carries a "no strings attached" stipend of $500,000, paid out to the recipient in equal quarterly payments over five years.